Field Forensics’ ruggedized HandyRam™ is a latest generation handheld Raman spectroscopy instrument that identifies illicit narcotics, controlled drugs, explosives, pharmaceutical ingredients and a wide range of other substances. Thousands of compounds are available in FFI’s spectral libraries. It is the smallest ruggedized Raman device on the market today and yet is incredibly powerful with features that larger systems do not have, including Rapid Laser Spin (RLS™), which dramatically improves safety when analyzing energetic materials. HandyRam™ features a durable and waterproof construction yet can also be connected to a PC for detailed spectral analysis, library and record management. 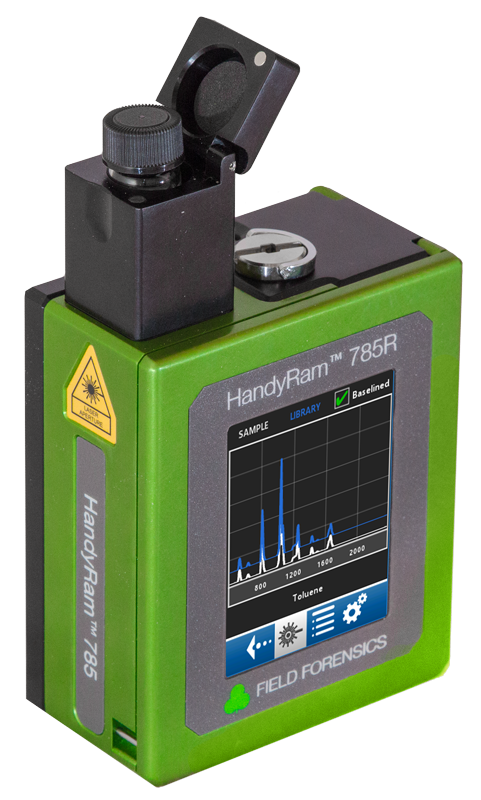 HandyRam™ has two modes of operation, 1) Point-and-Shoot Mode in which users measure solids or liquids directly or through a plastic bag or glass vial, and 2) Vial Measurement Mode in which the user inserts a sample vial into the vial adapter – this is very useful for later analysis of found-chemicals and for archival purposes. CBRNE platoons, EOD responders HAZMAT teams, crisis response teams or other specialized military and police forces use HandyRam™ in support of operations where effective on-the-spot handheld, rapid chemical detection and identification capability must be available. It operates on rechargeable or alkaline AA batteries and is easy to maintain and support in tough environments. The system can be used as part of a hardware and method-based system to give military and law enforcement, objective, concise techniques to quickly screen for toxic chemicals, chemical weapons agents (CWA), home made explosives (HME) and their precursor chemicals, commercial and military explosives, narcotics and narcotics precursor chemicals. FFI’s objective is to achieve identification results as close as possible to laboratory analyses but in forward-deployed non-secure areas. Users of HandyRam™ has several spectral libraries available and these can be chosen depending on the user’s application – these are in addition to the standard library, which comes with all units. For example, police officers might choose just the narcotics library; customs and border agent might choose narcotics and explosives libraries. Other users might want a more comprehensive library of explosives, narcotics, industrial chemicals – thousands of chemical compounds. A subscription service is available, which provides users with quarterly updates of new spectra. HandyRam™ has several safety features such as acquisition delay, laser power control, and Rapid Laser Spin (RLS™). Acquisition delay is a user-programmable feature in which the laser turned on after a time delay; this delay allows the user to get away from the object being measure before the laser is turned on in case there is a detonation. RLS™ (see below) prevents sensitive material from getting too hot but acquisition delay is a good additional safeguard. The user can also control the laser power settings as an additional means of protection when measuring what might be sensitive chemical. RLS™ is a unique laser manipulation process that continuously translates and rotates the laser point within a specified area during an acquisition. RLS™ protects the user by preventing overheating and destruction of samples. Analytically speaking, RLS™ has an additional benefit in that it gathers information from multiple sampling points in a single acquisition to provide an accurate overall sample measurement. As a complement to RLS™, the HandyRam’s Mixture-Analysis identifies major components in complex solid and liquid mixtures. For example, Mixture-Analysis will identify cutting agents found with illicit narcotics. With RLS™ and Mixture-Analysis combined the user has greater analytical power in field applications. HandyRam™ comes with computer software that allows users to generate reports, create and upload user libraries, manipulate and process spectra. Supervisors are forensics teams can also add spectra to a library or create their own library. The software is easy to use and requires minimal training. Please contact us today for the latest information on our HandyRam™ and other instruments and test kits for rapid field-identification of chemicals.